Revenue collected by the State of Illinois from the largest two areas of legal gaming in the State, riverboat casinos and lottery, both declined significantly in fiscal year 2015 while the State’s more recently implemented video gaming continued to grow. However, unlike previous years the gains in video gaming were not enough to offset the losses in the other areas. According to the annual gaming report produced by the Commission on Government Forecasting and Accountability, total revenues from taxation of gaming and the amounts received from the lottery declined in FY2015 by 5.8% to $1.2 billion from $1.3 billion in FY2014. This was the first year of decline since FY2012, when revenue from a new casino opening in Des Plaines bolstered receipts. Revenues continued to grow when video gaming began in FY2013. Prior to these new sources, State gaming revenues had been on the decline since FY2006. The following chart shows the gaming revenues collected by source for the last five fiscal years. The lottery has made up the largest portion of State gaming revenues since its implementation in 1975. In FY2015 lottery revenue totaled $690 million, a decline of $125 million from the previous year. The loss in revenue marks the largest decline in the history of the lottery and returns it to the same level as FY2011, the last year before a private operator took over management and online marketing of the lottery. The private company has missed its revenue targets every year and owed the State a penalty under the contract. The penalty amounted to $35.7 million in FY2014, $38.6 million in FY2013 and $21.8 million in FY2012. These amounts are included in the totals above. A penalty is expected to be assessed in FY2015 but has yet to be received by the State. The majority of the lottery revenue loss is attributable to a change in payout ratios that resulted in an increase in prize costs of $77 million in FY2015 compared to FY2014, according to the COGFA report. Total lottery ticket sales actually increased by $39 million in FY2015 and totaled $2.8 billion. Riverboat casinos experienced a second consecutive year of lower State tax revenues in FY2015, totaling $292 million, down from $321 million in FY2014. Total tax revenue from casinos is trending downward despite the addition of a tenth casino in FY2012, which helped the State’s tax revenues recover slightly after six straight years of declines dating back to FY2006. Since riverboat gaming was legalized in 1991, the State’s revenues from casinos reached a peak of $699 million in FY2005. In FY2006 the State reduced its tax rates on casino revenues, which reduced tax receipts despite the increase in total revenues collected by the casinos. Then in FY2007 the original nine casinos began experiencing a loss of revenues, resulting in a corresponding loss in tax receipts to the State, which continued through FY2015. Since opening in FY2012, the Rivers Casino in Des Plaines has seen moderate increases in revenue each year growing to $428.2 million in FY2015 from $393.5 million in FY2012. However, total casino revenues in Illinois have declined to $1.5 billion from $1.6 billion in FY2012, despite the success of the new location. Video gaming was legalized in 2009 but did not immediately go into effect due to delays in implementing monitoring technology and licensing rules. Video gaming is taxed at a rate of 70%, of which 5/6th goes to the State as part of the funding for the capital budget and 1/6th is provided to local governments where the terminals are located. 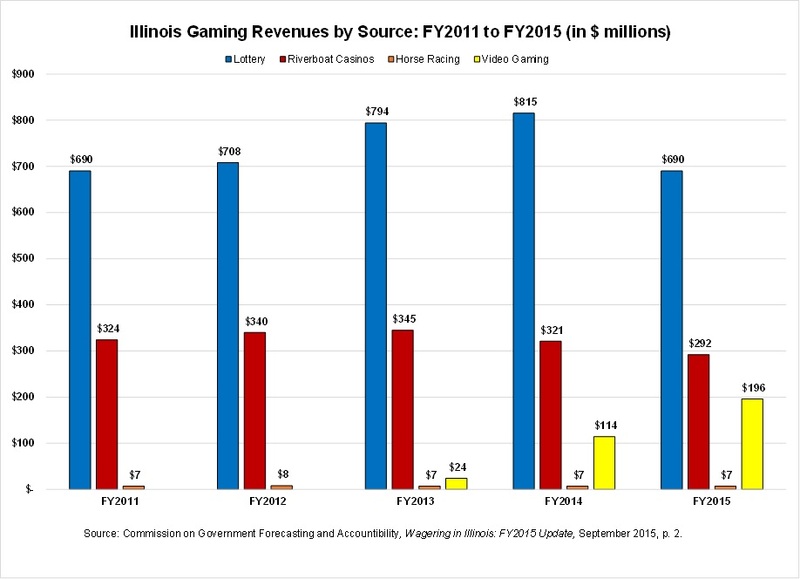 The COGFA report concludes that the rise of video gaming in Illinois is the largest driver of losses in casino revenues. The State began issuing licenses for video gaming to bars, restaurants and fraternal organizations – limited to five machines per locations – across the State in 2012 and began receiving revenue in FY2013. As shown in the chart, video gaming continued to grow in FY2015. Revenue from taxation of video gaming totaled $196 million in FY2015, up from $114 million in FY2014. As previously discussed here, the total amount of revenue from video gaming is still well below the initial legislative estimates of more than $500 million annually mostly due to the ban on video poker in the City of Chicago. Despite the State’s largest city not participating in video gaming, Cook County has the largest number of licensed terminals in the State, totaling 3,271 as of June 30, 2015. The total number of terminals in Illinois as of the end of FY2015 increased to 20,730 from 17,476 at the end of FY2014. After discussions with the Illinois Gaming Board, COGFA projects that the number of video gaming terminals will total 23,500 by the end of FY2016, increasing tax revenues to approximately $282 million.